Since I started blogging almost 2 years ago, I have seen the good, bad, ugly, funny and strange. It’s been a learning experience for this 30-something year old, who sees the best in all. At least I try but I’m not perfect. However one of my bug bears of late, is the invalidation of people’s feelings. You know the ‘don’t feel sad’, ‘don’t frown’ or ‘that’s nothing to be upset over’. These are words of platitudes that we all (myself included) have said to someone at some point in our lives. What I realise is that it invalidates their feelings by making it about us. We make it about us because a lot of the times we feel uncomfortable or it touches on our own fears and personal demons. Automatically, we tend to push those feelings away and the other person in the process unintentionally. If someone you care about is upset or hurt, it is only natural for us to want to soothe and support them. That’s just human nature. What isn’t helpful for the person in pain, crisis or in distress is to be told that what they’re feeling is unimportant. I remember once being told ‘you’re hurt, what about how I feel?’ by my exes mother. It suddenly dawned on me that my pain was irrelevant and attention should now be on her, even though I was the ‘injured’ party here. When you are told in subtle ways that your feelings in that moment are not important, you start to question your validity as a person. You know the whole, ‘Are my feelings even important?’ kind of questioning. Which can sometimes lead to you questioning your existence, which is not pretty. This spiral of questioning can lead to poor self esteem and how you view yourself in this world. Essentially it’s about thinking about how you would like to be treated when you’re in emotional turmoil. I’m pretty sure having your feelings dismissed would leave you feeling piss poor (excuse the language). Perhaps we just need to be a little bit kinder and thoughtful with our words. They have the power to make a huge difference. 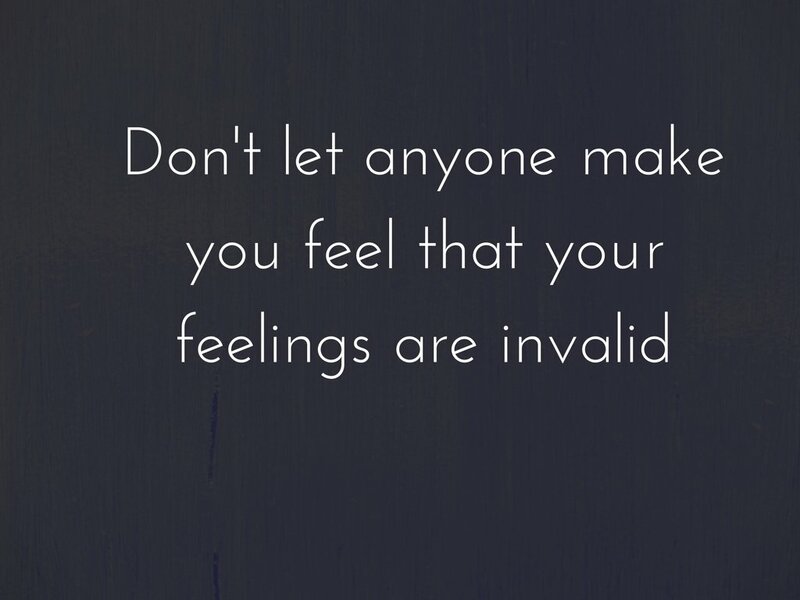 Have you ever had your feelings invalidated before? How did you deal with it? Leave your comments below.